Click here to download a PDF insert for your church’s bulletin! Many of our patients and friends of the ministry have attended this beautiful evening of music, dinner, and fellowship. As usual pastors and their wives are our ministry guests. 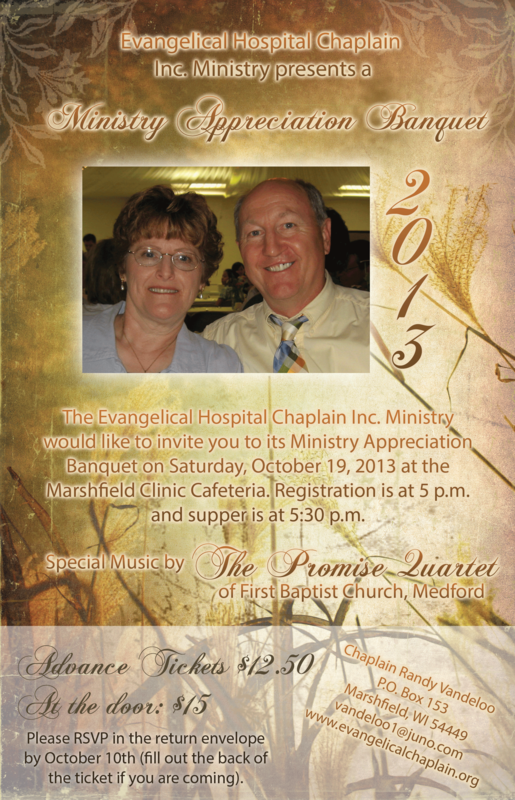 As in the past the dinner will be held in the Cafeteria of the Marshfield Clinic. We have attempted to have an earlier dinner and program to get us all home at a reasonable hour. We are hoping that one of our supporting churches mission’s committee will help us with our table decorations. If you feel the leading of the Holy Spirit to minister in this way please contact me. A free will offering will be taken to help the ongoing work of this ministry. Enclosed with this writing is the Flyer and tickets announcing the Ministry Appreciation Banquet on Saturday, October 20th, 2012. We are hoping that all our supporters and their Pastors will come out to give the Lord praise for the great things He has done through this unique ministry of helps and encouragement to those in crisis at Ministry St. Joseph’s Hospital. If planning to attend the banquet and to give an accurate count to our caterer please fill out the back of your ticket and mail in the enclosed self-addressed stamped envelope provided for your convenience by October 11th. If you need additional advance tickets please give me a call, ask via US mail, or drop an e-mail to me requesting additional tickets prior to October 11th. This is vitally important to ensure an accurate count of banquet attendees for the caterer. As the winter is upon us and I reflect on the many blessings of the Lord this past year I am moved with a heart of gratitude for His grace and mercy towards my family and ministry. I would like to thank you our fellow ministry partners for your faithful support in prayer and giving that keeps this ministry viable. 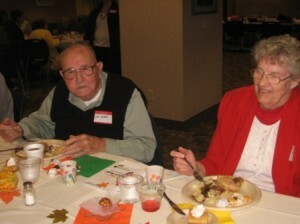 The fall banquet was such a success and I believe a real blessing for those who could attend. The music of the Christian Celtic Band, the message by Dr. Claussen on how God can use palliative care, the food, and fellowship were such a blessing. Your generosity and support of this ministry was truly a gift of the Lord through His people. Thank you. If you were unable to attend we would look forward toward your attendance in the future.